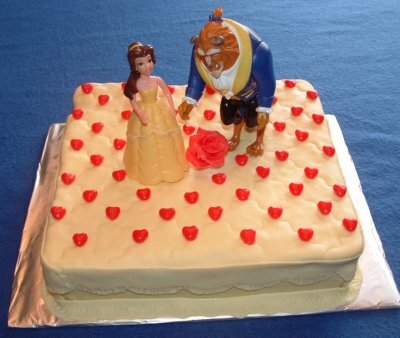 I made an 8 inch square double layered Beauty and the Beast Cake. I wanted the cake to look like they were in the ball room dancing. I made a light yellow fondant and rolled it out thin and placed it onto the cake. I then used my Wilton Ribbon cutter/ embosser to create the floor. I placed on a wave design and created the ceramic design for the floor. I then made a ruffle boarder using the Wilton straight scallop cutter. I made a ruffle at the top of the cake and with the same tool I cut another scallop for the bottom. At the bottom I used a fondant and gum paste tool that looks like a shell to make a nice design for the bottom. To accentuate the ceramic floor I placed a cinnamon heart at the crosses. I placed the Bell and the Beast dolls on top of the cake (my daughter’s toys). To finish off the cake I made a red rose out of gum paste and placed it on a spaghetti noodle to stick into the cake. The rose did still have all the leaves on the flower. What a fantastic cake to enjoy while watching the Disney Beauty and the Beast Movie !